What do you picture when you hear the word art? You probably picture a stunning sculpture or a gorgeous painting. But what about cars? Do you consider them art? Sure, they are masterfully designed, but they aren’t really art. That is, unless you are talking about art cars. I have never heard about art cars. What are they? Art cars are exactly what they sound like, art made out of cars. However, you cannot truly appreciate the beauty of them until you see them in person. Artists who create art cars are their own kind of breed. They are some of the most creative people you will ever meet, and it shows in their cars. Some of them make their cars look like a shark on wheels, while others cover the entire car with cameras. And still, some artists simply use paint to express their creativity. There are even interactive art cars that encourage people to push buttons or write on them. 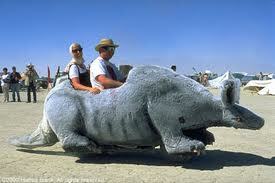 One thing that all art cars have in common is that they are actually drivable. Why do people make art cars? Well, it’s not because they are bored. People who have art cars do so for many reasons. Some people have a passion that they want to share with the world. Others are looking for the attention that an art car garners. And others do so for personal or political promotion. Making an art car takes an average of a year, so it is clear that a true passion for the art has to exist. Do they actually use them? Would you spend a year of your life making something only to hide it away? Probably not. That is why most art cars are used for day-to-day tasks. They may not be the owner’s primary vehicle (although sometimes they are), but they are definitely driven around town. Seeing an art car in the grocery store parking lot or at the drive thru window is not unlikely. 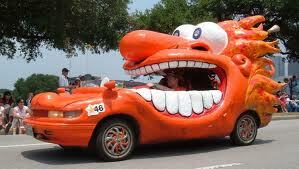 However, drivers of art cars are some of the most cautious drivers you will ever see. They always drive defensively so that they can protect their work of art. So they must just use clunkers, right? Even though that would make sense, since the cars are getting transformed from their original state, most people choose cars that still have many years left in them. They don’t want to have to worry about huge maintenance costs causing them to ditch the car they spent so much time on. If you have never seen an art car, you are truly missing out. Luckily, there are many places to see them around the country. That being said, Houston seems to be the hub of art cars. They have the largest art car parade in the country and are even home to the Art Car Museum. So what are you waiting for, get out there and go see them! If you are even braver, why not make your own?